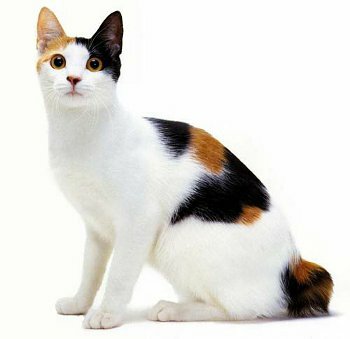 The Japanese Bobtail cat, as a breed, is active, playful, talkative, and intelligent. They tend to get along well with other cats and bond to their families. By most accounts, the Japanese Bobtail (JBT) breed has been in existence for over 1,000 years. This would certainly make it one of the oldest cat breeds. More about the history of the JBT breed. It wasn't until the late 1960s, however, that these cats were brought to the United States. By 1970, JBT cat lovers had formed a breed a club. They achieved championship status with the Cat Fanciers Association (CFA) in 1976. Both longhair and shorthair versions of the breed have been depicted in Japanese art for centuries, and both are now permitted by the CFA in the show ring. The longhairs achieved recognition in the early 1990s. The short hair JBTs have a medium length coat, with the longhairs being medium-long to long. The CFA breed standard for both short and longhair versions of these kitties requires no "noticeable undercoat." Their coats are described as "soft and silky" and the lack of a thick undercoat makes them easy to maintain, even in the the long haired version. Once or twice weekly brushing should be sufficient to avoid matting (although daily grooming is a great habit to get into with any cat, and can greatly reduce hairball issues as well). Bobtails can be found in many colors covering their athletic bodies. In fact, only the Siamese type (colorpoint) and the Abyssinian agouti pattern are not allowed in show cats. Japanese Bobtails may be tortoiseshell or tabby cats. They may have bicolor patterns, as well as solid colors. They may be pure white or coal black, or they may be black and white. Bobtail cats may be "patterned," such as tabby and white, and many other combinations are possible including patched tabbies, or mackerel, classic, or spotted tabby in various colors. The tricolored variety, known as Mi-ke (pronounced "Mee-Kay") is highly favored. The Mi-ke is a calico cat, with black, red, and white. The red areas may have tabby striping or spotting. Other Mi-ke colors include dilute colors, Silver patterned, and Smoke Mi-ke. The Smoke Mi-ke has a white undercoat in the non-white areas of the cat that is "deeply tipped in black or red." Mi-ke are very striking in the "van pattern" where a white cat has coloration primarily on the head and tail areas. 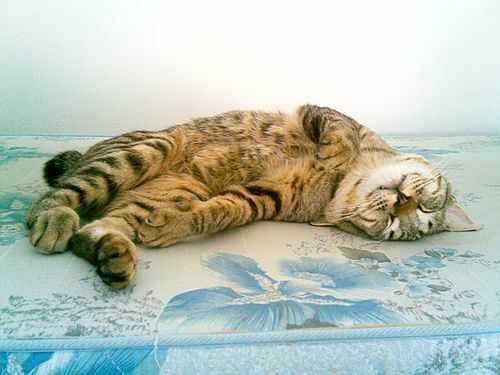 Rather than looking for one particular tail shape in the breed, each tail is as unique to the individual cat as a fingerprint. Tails on these kitties may be rigid or flexible, and have curves, kinks, or angles, or combinations of these characteristics. For the show cat, the tail needs to have a "fluffy appearance" beginning at the base. Not surprisingly, tails are referred to as "pompoms" or simply "pom." JBTs tend to be interactive and have big personalities. Like the Siamese cat breed, they are active and vocal, although it's hard to imagine any cat outtalking a Siamese! When spoken to, however, JBTs often talk back. In addition to enjoying vocal conversations with their humans, JBTs love playing games. Many enjoy a good game of fetch. Although the Japanese Bobtail loves human company and interaction, they also tend to get along well with other cats and, if introduced properly, even dogs. Having a playmate may help keep your Bobtail out of mischief, but there may be some mayhem if they decide to team up on the curtains. When in groups, they're said to be cliquish. I'd recommend, as I always do, getting them in even numbers so that they can pair up. Inquisitive as they are, your Bobtail may make up her own games if she's not stimulated enough. In addition to other cats to play with, active cats like these need the sturdiest and best cat toys to keep them happy. Tabby Japanese Bobtail by Komisuamae [Public domain], from Wikimedia Commons. 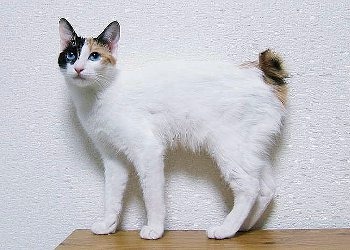 Female blue eyed Mi-ke van pattern cat ​Wikipedia Japan user ようてい [GFDL or CC-BY-SA-3.0], via Wikimedia Commons.